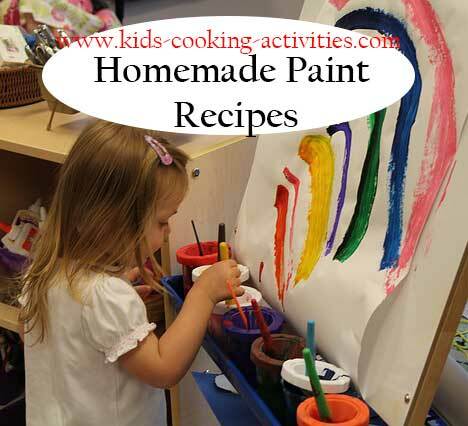 Homemade paint recipes can create an at home art and cooking project combined in one. Not only will it be a great activity to create your own recipes using items at home it will save you money! Put water, starch and flour into saucepan. Cook over medium about 5 minutes. Stirring constantly. Allow to cool. Pour mixture in small plastic containers and add different coloring to each container. 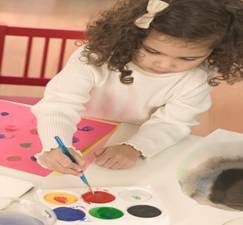 Place a sheet of paper in a baking pan and drip colored paint onto sheet of paper. Add golf balls and have your kids shake the pan to make a design. Let dry. Mix salt, flour and dry tempra. Stir in water to make mixture the consistency to drip off of a spoon. Use a funnel to fill squeeze bottles. 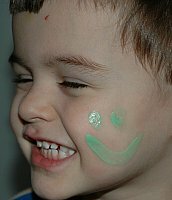 Let child make design by dripping from squeeze bottle or dripping from a spoon onto construction paper. Dry flat overnight. Place flour in small saucepan. Gradually stir in 1 cup water. Cook over medium heat until thickened, stirring constantly. Cool. Measure 1/4 cup mixture into each of 4 small clean jars. Add 2 tablespoons water to each jar; blend well. Add 1/2 teaspoon dish washing detergent to each jar if glossy finish is desired or add 1/2 teaspoon starch to each jar for matte finish. Store tightly covered. Mix well before using. Whip with an eggbeater until stiff. Add coloring and store in plastic containers. Mix flour, salt and water in bowl until smooth. Divide into containers and add coloring. NOTE: Paint on thick cardboard. Once kids have painted on thick cardboard. Microwave for 10-30 seconds. Paint will become puffy and dry. Mix both items in a bowl in the amounts given or smaller or larger equals parts depending on your project. Stir together for about a minute or two. You can add food color or glitter. It dries to a puffy marshmallow texture that is not sticky. You can paint this on with paint brushes or use squeeze bottles. My kids used this to make snowman cards for family this past holiday. They turned out very cute. Mix together until cornstarch is mixed well. I make 3 cup batches this give me enough for 6-8 colors. In a small bowl, mix shortening, cornstarch and white flour. Add four drops of glycerin. Stir to a creamy consistency. Add any food coloring that you wish. For brown makeup, add 2 1/2 teaspoons of unsweetened cocoa instead of food coloring. Stir together the cornstarch and cold cream until well blended. Add water and stir. Add food coloring, one drop at a time until you get the desired color. Experiment with different colors. Paint on with a paint brush. Store in covered containers. 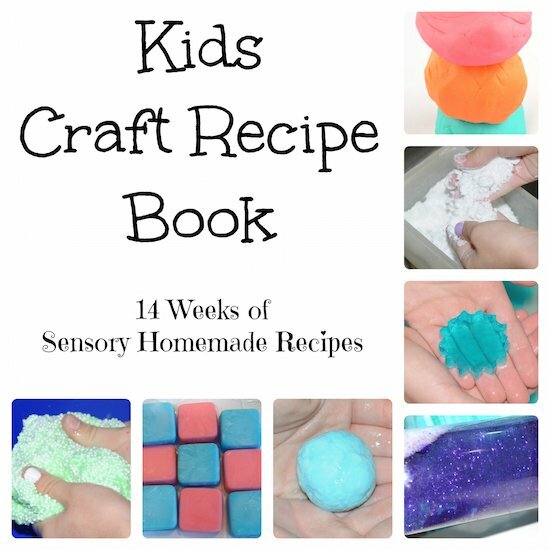 See recipes for finger painting!